Sermon for Pentecost 16: "God Isn't Fair"
We’ve all heard it (or said it) before. On the playground, in the classroom, or at the dinner table…that famous phrase, second only in our early childhood vocabulary to the word NO! We say it at work, home, school. We say it when we watch news, sports, or our neighbors. We say it when we’re outraged, offended, or scandalized. 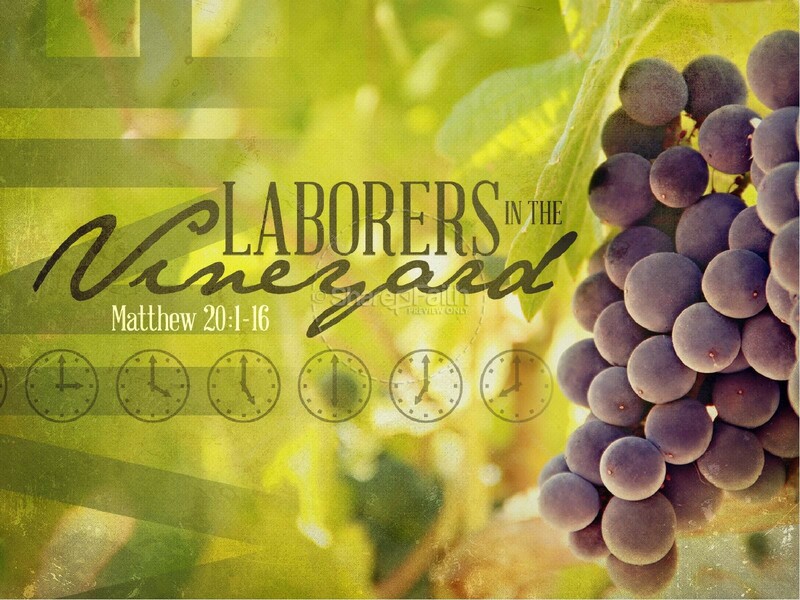 We hear the same complaint from the workers at the end of Jesus’ parable of The Laborers in the Vineyard. Did you hear it? We worked longer, harder, and accomplished more than those 11th hour bums. That’s not fair. This parable reveals yet another shocking, outrageous truth: the Kingdom of heaven isn’t fair. But that’s a good thing. Fairness is the Law – you get what you deserve. Grace is Gospel, Good News of outrageous forgiveness for undeserving sinners – you get what you don’t deserve. And that’s the Kingdom of heaven. If fairness is what gets us into the kingdom of heaven, then it’s all on us. But if God’s grace is what gets us in, then that’s Good News. Salvation is God’s gift for you. The last are first. The guilty go free. Sinners are justified. When Jesus tells this parable, the fairness police, or the Law-hungry Pharisee within each of us, is offended by this parable. It doesn’t fit into our way of thinking. “You get what you deserve. You reap what you sow. A day’s work for a day’s pay.” That’s how we think. That’s the way of the world, we say. And we expect God to play by our rules. To be fair. So, what about the Landowner in this parable, is he fair? Of course, he isn’t fair. But he is good. “For the kingdom of heaven is like a landowner who went out early in the morning to hire laborers for his vineyard. (Think something like 6 AM) Now when he had agreed with the laborers for a denarius a day, he sent them into his vineyard. And he went out about the third hour and saw others standing idle in the marketplace, and said to them, ‘You also go into the vineyard, and whatever is right I will give you.’ So they went. Whatever is right, our English translations say. Better said, whatever is good, righteous, or better yet…justified. Remember that word later. Again, the landowner goes out and does the same thing at noon and 3 PM (the 6th and the 9th hour). He found some laborers still hanging around and hired them for some unspecified just wage. And they agreed. At 5 o’clock, as the sun was setting, there was still work to do. So, he goes to a local bar where some deadbeat losers were hanging out all day doing nothing because no one hired them. 6 PM finally arrives. It’s beer-thirty. The workers head to the steward to receive their money. And here’s where the fun begins. The vineyard owner lines them up in reverse order, from last to first, from the eleventh hour losers to the first hour workers who agreed to work for a denarius a day. When they eleventh hour workers opened they pay envelope…surprise! A shiny denarius! Wow! One hour’s work and a full day’s wage. Imagine what happens as the other workers start to hear the news. “He’s paying a denarius an hour!” The twelve hour workers at the end of the line are busy rubbing their hands together. Hmm…a denarius an hour. This is great! But as the workers are paid, reality kicks in. Everyone gets one denarius. The workers are bumfuzzled at the Landowner’s behavior. But they’re also livid. “These last worked only one hour, and you have made them equal to us who have borne the burden of the day and the scorching heat. Imagine a youth soccer league where the last place team gets the same big trophy as the undefeated first place team, in that order. That’s crazy, ridiculous, not to mention…it’s not fair! You see, this parable is a story of Judgment and grace. Judgment for those who resent and reject God’s grace. And God’s grace given to all who least deserve it. Like the workers, we expect God to be fair. But here’s the rub. If we want God to be fair, to deal with us according to our works, our achievements, our accomplishments and all the things we do, then we will be condemned. That’s fair. Those are the terms of the Law. The wages of sin is death. We love to keep score and carry our spiritual punch cards around with us, always comparing and measuring ourselves to others, especially their faults and sins. Thank God I’m not like that murderer, adulterer, homeless guy, illegal immigrant, and so on down our list. It’s not fair, we say. How can God forgive someone like that? But he does. Think about it…if God was fair, we’d all get what we deserve. Thank God that his thoughts are not our thoughts, Nor our ways his ways,” as the prophet Isaiah reminds us. Thank the Lord we don’t get what we deserve. Thank God, he’s not fair. Because if there’s room in the kingdom of heaven for hookers, murderers, and tax collectors; for Peter the denier and adulterous David, for doubting Moses and faithless Israel, the thief on a cross and 11th hour workers – then there’s room in the kingdom of heaven for me and you. 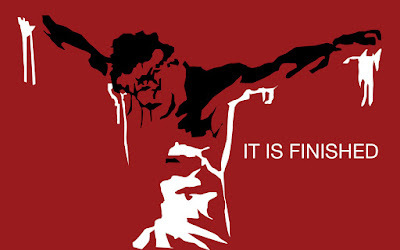 Like the 11th hour workers in the parable, we live off of the work of another: the Landowner who was crucified at the 3rd hour, who from the 6th hour was hanging on the cross under the heavy burden of our labors, as darkness covered the land, and at the 9th hour he cried out “It is finished” as he died to save you. By the 11th hour Jesus was taken down from the cross and laid in the tomb for you, his work on the cross complete for you. With God we receive equal salvation for unequal work. A denarius just for being there, regardless of what you did. Everyone receives the same death and resurrection, the same Baptism, the same Body and Blood, the same forgiveness. All by grace through faith for Jesus’ sake. With these words “The first shall be last” – Jesus takes away our pride, and then takes away our despair by promising “the last shall be first”. We’re the 11th hour workers, the last ones, the losers and failures, the broken sinners who make it into the kingdom by the skin of our teeth. And this laborer, our savior Jesus, worked his hands to the bone and the nail for you. 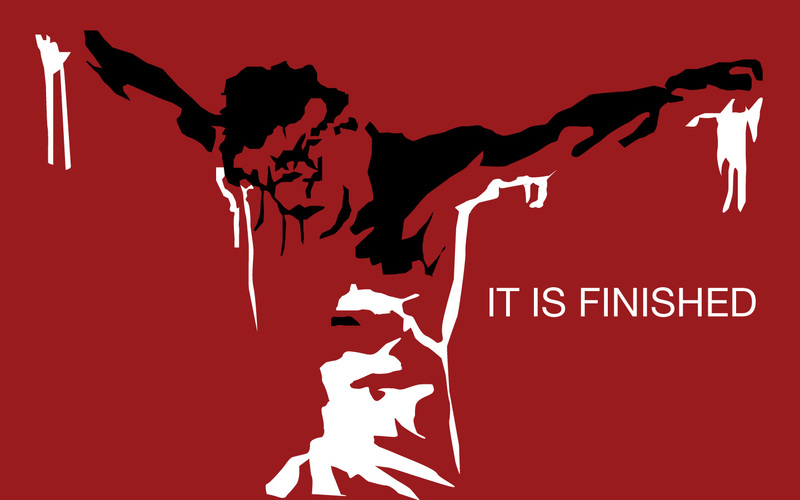 He worked himself to death for you. He rested from all the labors that he had done for you. Is it fair? No. He’s not a fair God, but he is good and righteous and in Christ you are justified. Sermon for Pentecost 14: "Greatness in Weakness"
“Who is the greatest in the kingdom of heaven?”, the disciples asked Jesus. It sounds so foolish and oblivious, and it is. But before we utter a collective sigh and plant our face firmly in our palms, remember that we’re really no different from the disciples. We ask this question all the time. Lately, athletes have been quoted saying, “ I want to be the GOAT. Now, they’re not talking about hooved barnyard animals – they want to be the greatest of all time. We think of great athletes like Michael Jordan, Serina Williams, or the Great One Wayne Gretzky, who dominated the court or the ice. In business, we think of Steve Jobs, Warren Buffet, or the Forbes top 100, men and women who build huge companies, employ thousands, and are worth billions. In politics and history, the great figures change the course of events, for better and worse. We sing along proudly with the song of the times: you can be the greatest; you can be the best. You can be the King Kong bangin on your chest! In one way or another we’ll all like the wicked Queen in Snow White, “Mirror, mirror on the wall, who’s the fairest of them all?” We think of greatness in terms of achievement and accomplishment. Greatness is winning, not losing; success, not failure; power, not weakness. That’s greatness, at least in the kingdom of this world. But what about greatness in the kingdom of heaven? Greatness in a child? Seems like a rather foolish, weak, and lowly example of greatness. You see, in the first century children were considered lowly, and utterly dependent – the opposite of great in most peoples’ minds. But the kingdom of heaven isn’t measured by achievement. It’s not about the greatness of our religious works or accomplishments, but the greatness found in the weakness of the cross. And so, Jesus teaches his disciples then and now that in the kingdom of heaven greatness is found in littleness. Little children don’t have much in the way of achievements. They live by grace through faith (trust) in another. They’re “giveable to,” on the receiving end of everything, utterly dependent. This makes a child a perfect picture of faith. The greatness of faith, trust in Jesus is found in what He has done for you and what He gives to you, that’s greatness in the kingdom of heaven. But this was the disciples’ problem; it’s ours too. We want to increase. We want to be great. We want to be kings of our own kingdoms, whether it’s in Christ’s kingdom, or in our daily kingdoms we live in in this world. In other words, we want to be god. We fear, love, and trust in ourselves. Such is our sinful delusion of grandeur. We are only the greatest at one thing: the greatest of all sinners. We are the lost sheep in the parable. We are curved inward on ourselves, in love with our own sinful thoughts, desires, and deeds. We are dead in our trespasses and sin. We are the ones who deserve to have the millstone hung around our necks and be cast into the depths of the sea. Thankfully, the kingdom of heaven isn’t about our greatness, or our anything at all. It is completely unexpected. In the Kingdom of heaven, Humility and weakness are greatness. Little and lowly ones are exalted. Lost are found. Losers are winners. Failures are victorious. The last are first. The least are the greatest. The guilty go free. We who are dead in sin are made alive in Christ. Sinners are justified. Jesus drives the point home with a parable. “What do you think? If a man has a hundred sheep and one of them goes away, doesn’t he leave the ninety-nine on the mountain and go searching for the lost one?” Well, what do you think? The world would tend to write that one sheep off as dead. And yet it’s the joy of the Good Shepherd to seek and to save the lost. He is restless until we are found safe and sound, not wanting one of these little ones to perish. 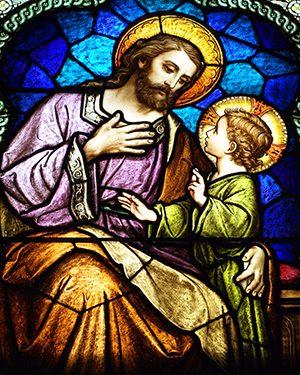 This is why Jesus became a little child for you so that in his dying and rising he would call you children of the heavenly Father. Jesus who knew no sin became sin for you. Jesus became the least, the last, the lowly, and the loser to place you at his table in the marriage supper of the Lamb. Jesus became the stumbling block, the stone the builder’s of Israel rejected. Jesus died the cursed death so that you, baptized and believing as one of His little ones, might enter the kingdom of heaven through the small and narrow door of His death and resurrection. Jesus took the millstone of death and our lawlessness and hung it around is own neck, so that he would cast all your sin into the abyss of his tomb. Jesus sought you in His death and He found you. He baptized you. He absolves you. You feeds you. He sustains you. He carries you to the flock of His Father’s kingdom with the joy of a shepherd who has just found His favored, lost sheep. This is what true greatness looks like, Jesus crucified for you. The love of God in Christ revealed in the shepherd who is willing to lose everything in order to save one who doesn’t deserve to be saved. You’re that sheep. He came to save you in your helplessness, lostness, death. For the joy set before Him, for the joy of returning you to the Father’s fold, for the joy of forgiving you, for the joy of your salvation, Jesus endured the cross and scorned its shame. Jesus wins by losing; accomplishes victory for you by defeat; and brings us his great salvation through weakness and humility. This is greatness in the Kingdom of heaven. God’s outrageous forgiveness for undeserving sinners. Greatness in weakness. Greatness in humility. Greatness in forgiving others as God in Christ has forgiven you. And that brings us to that last part of today’s Gospel reading, greatness in forgiveness, especially among God’s people in the Church. The Church, as Luther said, is a “mouth house of forgiveness.” A place where this seeking, saving love of God in Christ comes to bear on sinners. We have a charge. If your brother or sister sins against you, go to him. The world would have you go to get even. Christ would have you go to forgive as you have been forgiven. Go to him. Tell him with the intent and purpose of forgiving. If he refuses, bring a couple of others. The whole church, if necessary. Can you imagine congregational life if we did this? Can you imagine the impact of the church in the world if we actually forgave one another and sought out opportunities to forgive? Sadly, it doesn’t happen all that often. We leave. We avoid. And in the end, we only cheat and hurt ourselves. Go to your brother or your sister who has sinned against you. This is what the Church is to be about – binding and loosing. Binding Sin. Liberating sinners. Forgiving; being forgiven. Jesus is bound to His Church as Bride and Groom. They are one flesh. What she says in His Name, He says. What she does in His Name, He does. And even as small a gathering as two or three in the Name of Jesus has the promise that He will be there too, right there in our midst. Two or three may not seem like much of a congregation. Certainly not a great one by today’s mega-church standards. But it is a holy quorum in the eyes of the Lord. Jesus is fully present here in the humblest of gatherings with the fulness of His gifts. Who is the greatest? 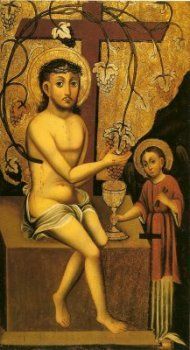 A little child, a lost sheep, a congregation of two or three, a crucified Savior who comes in the humility of simple water, spoken words, bread and wine. All for the joy of seeking and saving you, a sinner redeemed by Jesus.